Lincoln Center is full of “thinker” plays right now. Luce, currently playing at the Claire Tow Theatre through the LCT3 program, prompted another evening full of conversation as my theatre companions and I debated what actually went down during those 100 minutes. Luce marks the New York professional debut of JC Lee, an up-and-coming playwright and recent graduate of the Juilliard playwrighting program. He grew up with one of my best friends so I’ve known JC for a while now. I was even in a play of his back in 2007 in trusty ol’ Allentown, PA called The Nature Line. His dialogue is quick, smart, contemporary, and often provocative. 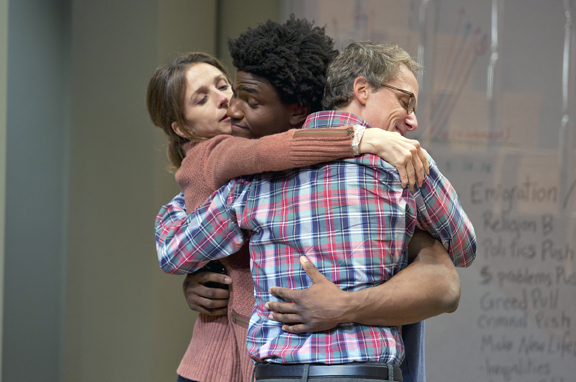 His new play brings up some interesting ideas about stereotypes, privacy, student/teacher relationships, culture, etc. As things kicked off, I wasn’t completely gung-ho about this production. The first scene turned me off. It felt forced on the acting front with everything being spelled out for us, and the blocking felt false and unnatural. Once I disengage, I admit it’s hard to bring me back from the edge, but after a couple more scenes, I was definitely drawn back in and more engaged. So we’ve got a boy named Luce, a 17-year-old kid from the Congo. He was adopted when he was seven years old by Amy and Peter, rescued from the war, and brought over to the states. He’s now a high school senior football player, hoping to get recruited. He’s an A student, popular, and everything his adoptive parents could hope for. Look how this poor boy turned out despite his past! He’s a dream poster child to everyone around him. But after some trouble starts to brew with one particular teacher, warning flags start popping up. When the teacher discovers illegal fireworks in his locker and brings in Amy for a little parent-teacher meeting, the plot is set in motion and we get to watch how his parents handle (or don’t handle) the situation. As things escalate, we are left to wonder: Is Luce innocent? Is he still plagued by his childhood and now acting out? Although I had trouble with some of the direction and acting, I think this was an exciting debut. The ambiguity of Luce’s innocence lasts the majority of the play. Although even that ambiguity is arguable. My friend made up her mind about Luce’s actions much earlier in the play than I did. We heard an adorable older woman leaving the play afterward saying, “I just don’t know what to think!” I personally don’t think the play leaves much doubt as to whether Luce is guilty or not of a certain act. It’s definitely left up to the audience until those last few minutes, but even then, one could argue it still isn’t 100% one way or the other. Most signs point to guilty, but do we give him the benefit of the doubt? I know I did. But is that only because I, like his mother, so desperately want him to be innocent because of his past? The play asks many questions: how much privacy should a teenager be allowed? Who’s really at fault here? But I left asking primarily: how far would you go to protect your child and your child’s future, no matter his past?